Last week saw the beginning of the 116th Congress of the United States, with Republicans controlling the Senate and Democrats controlling the House, and Mitch McConnell remaining in control as the Majority Leader of the Senate and Nancy Pelosi returning to the role of Speaker of the House. Additionally, we saw a record 102 women sworn in the House and 15 in the Senate. 36 women are freshman members of Congress; 23 Freshman House members are people of color. There are also currently more than 10 out openly LGBTQ members of Congress. We saw the first Muslim women and the first Native Americans sworn into Congress as well. This Congress is without a doubt the most diverse in our country’s history. CNN shared a picture of the variety of books that members of Congress chose to place their hands on when taking the oath of office. This included the Christian Bible, the Tanakh, the Book of Mormon, the Quran, the Buddhist Sutra, the Hindu Vera, and the Constitution itself. Locally, new members of Congress are veterans, former employees of the state department, and worked in previous presidential administrations. This is the same Aaron and Moses to whom God said, ‘Bring forth the Israelites from the land of Egypt, tribe by tribe. It was they who spoke to Pharaoh, King of Egypt, to free the Israelites from the Egyptians; these are the same Moses and Aaron (Ex. 6:26-27). Most biblical commentators wonder why the Torah awkwardly states that “these are the same Moses and Aaron.” Rashi explains that the reason it is repeated and stipulated that these are the same Moses and Aaron is because the Torah is clarifying that they remain committed to their cause. Quoting Tractate Megillah of the Babylonian Talmud, Rashi writes: They remained in their mission and in their righteousness, from beginning until the end. It is common for leaders to change, to become different people than they were when they rose to leadership. Most elected officials end up disappointing us, because they change their views, because they don’t live up to campaign promises – many of which were unattainable to begin with, because they might cozy up to lobbyist and special interests, or because they are more concerned with reelection than they are with governing or passing legislation. So let us pray that the members of the 116th Congress live up to the values found in the books that they placed their hands on as they were sworn into office. Let us pray that they live up to the ideals of the Constitution that they promised to protect. And let us pray that they, like Moses and Aaron, remain the same people they were before the titles “Representative” or “Senator” were place in front of their names. May they still be driven by the same mission; may they live a life full of the same righteousness. And may they be guided by the same principles. May they not become burnt out, or corrupted, or influenced, or bigheaded. Instead, may they be who they were meant to be. These are the same people as they were before, the Torah tells us. May they lead. And may our nation be better off as a result. On March 7th and March 8th, earlier this month, tens of thousands gathered in Selma, Alabama to mark the fiftieth anniversary of “Bloody Sunday”, the first attempted march across the Edmund Pettus Bridge. President Obama spoke and former President George W. Bush attended. They were joined by Democrats and Republicans — legislators, politicians, and civilians – all marching to commemorate the freedom-marchers clubbed and tear-gassed by state troopers as they peacefully marched for the right to vote half a century ago. 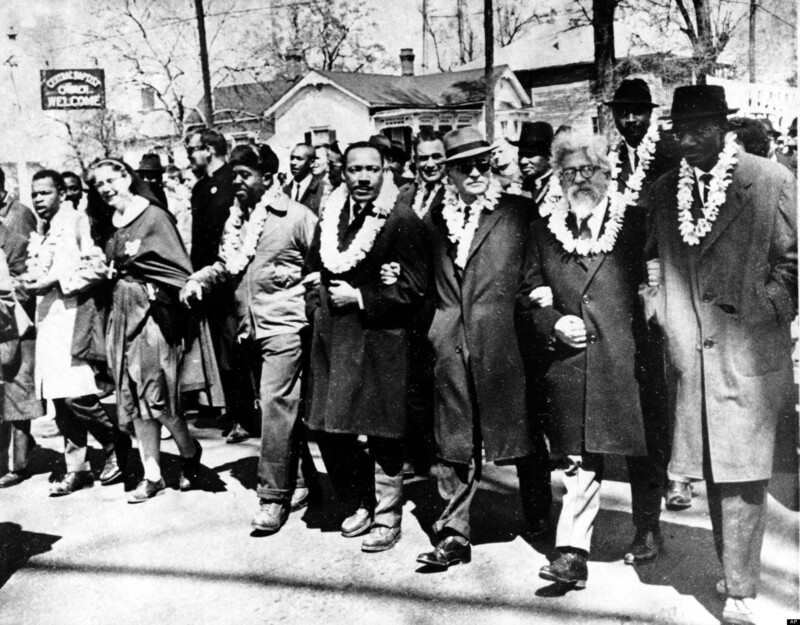 This past Shabbat, March 21st, 2015, was the anniversary of the third of those three marches, the march that led to the famous picture of Rabbi Abraham Joshua Heschel linked arm-in-arm with Dr. King, the march that was successful and led to the eventual passing of the Voting Rights Act several months later. 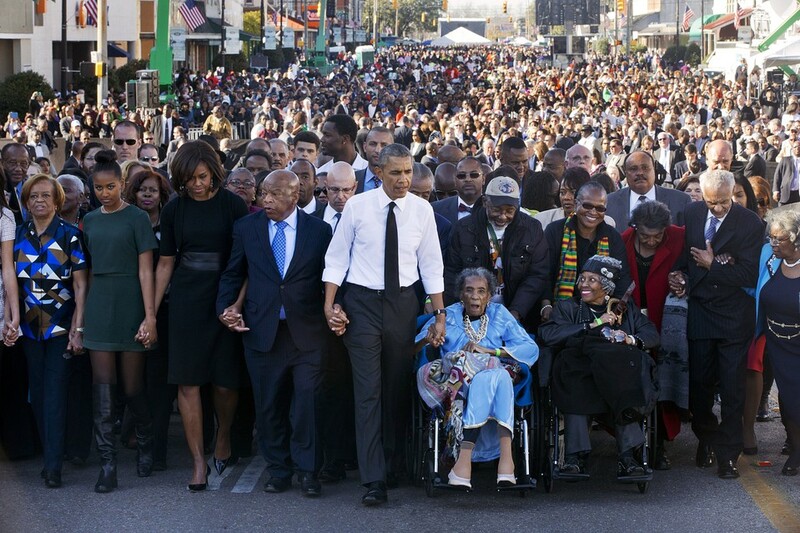 This march also marked the moment when religious leaders of all faiths, ethnicities, and races refused to stand idly by, and chose to walk alongside the likes of King, Lewis, Abernathy, Bunche, and Shuttlesworth. 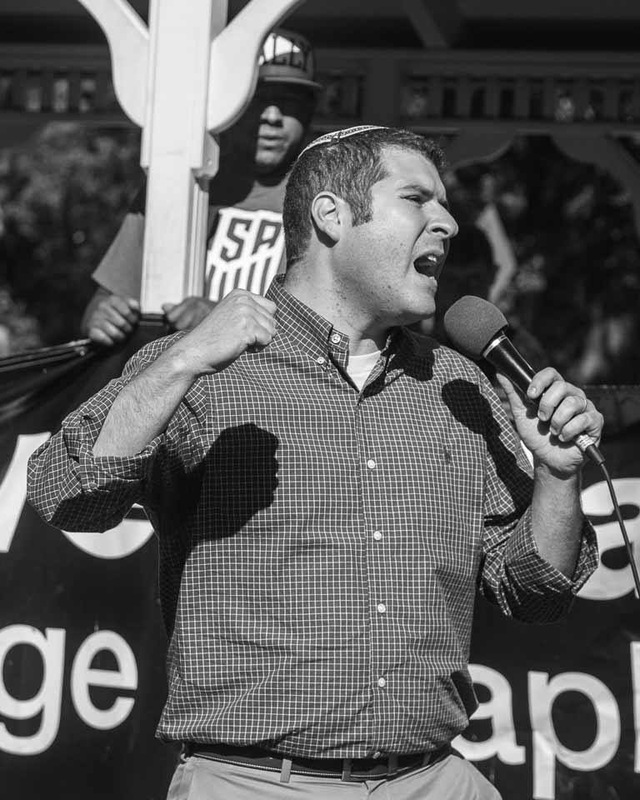 This march was a reminder that freedom is a God-given right so we must walk alongside our brothers and sisters to ensure that our freedom is their freedom. The likes of Heschel, and Rabbi Maurice Davis, and so many other religious leaders who marched, knew that we could not celebrate our freedom and our liberation while others were not yet liberated, while others were discriminated against. Fifty years later, we still talk about this picture and this march. We talk about how far society has come and yet, how far we have to go. This past Shabbat, as we observed this fiftieth anniversary, we also read a special Torah reading for Shabbat HaChodesh, the fourth of four special Sabbaths leading up to Passover. This special maftir Torah reading comes from chapter 12 of the book of Exodus and goes into detail about how to slaughter the pascal sacrifice and then how to eat that sacrifice. What we rush over, but what is arguably the most significant of instructions, is the reminder to put the blood of the sacrifice on our doorposts. For it was that blood that saved the Israelites and ultimately, following the tenth and final plague, led to their freedom. The essence of the ritual is to remind us of that freedom. B’chol Dor va’dor chayav adam lir’ot et atzmo, k’ilu hu yatzah mi’mitzrayim. In every generation, each of us is obligated to see ourselves as if we left Egypt. Such an obligation is not about remembering or re-enacting. Such an obligation is about acknowledging that there is still liberation that needs to take place in our society and in our world. Telling the Passover narrative must remind us of the marching that we still need to do, that there is still inequality in society, still those that we must work to liberate. Rabbi Michael Rothbaum of the Jewish social justice organization, Bend the Arc, offers insight into the rabbis of B’nai Brak that we read about in the Passover Haggadah. We learn in the Haggadah that they were so engaged in the seder that theytalk until daybreak, when their students interrupt them. Rothbaum reminds us that they were not discussing ritual or debating halakha, Jewish law. Rather, they were up until the early hours of the morning talking about liberation – about the exodus experience. A room of rabbis suffering through persecution at the hands of the Roman Empire were focused on our communal liberation narrative, in hopes of their own liberation. For ultimately, that is what the seder is all about: telling the story. In my family, we tend to rush through the rituals aspects of the seder in order to get to the magid section in which we retell the exodus narrative. We do so because we find hope and inspiration in the narrative. Such an exodus from slavery to freedom reminds us of what is possible. It reminds us that we must continue to fight for liberation of all. We must continue to fight racial injustice and gender discrimination. We must continue to fight religious persecution, bigotry, and homophobia. We must continue to fight, to march, and to take action, until we can all experience the journey to freedom. The Zohar explains that Egypt, Mitzrayim in Hebrew, is derived from the Hebrew MiTzarim, which literally means, “from narrowness.” We march away from narrow-minded discrimination and bigotry towards a promised land of equality and love. Civil rights leaders organized three separate marches from Selma to Montgomery. The first one ended with peaceful protesters bloodied and beaten. But they marched again, and again. We don’t just look back on a single march, but instead on all three marches, for in continuing to march, we find a determination and dedication to justice and to freedom. With each plague in Egypt, Pharaoh’s heart remained hardened, but that did not stop Moses from demanding to Pharaoh, “let my people go!” Each march shared a similar declaration. No matter how many times it took, people of all faiths continued to march and were determined to cross that metaphorical split sea. How can we celebrate freedom when others are not? How can we celebrate liberation when there is still such injustice in our society? This year we are slaves. Next year, free people. We acknowledge that as long as there is injustice, we cannot truly be free. We cannot celebrate freedom for ourselves until we can celebrate freedom and equality for all. So fifty years later, may we continue to march. May we continue to peacefully assembly and may our seder experiences serve as catalysts in our shared efforts to liberate us all from societal injustice. This year there is still injustice and discrimination. Next year, may we all be liberated.